Beijing International Airport is open for business again after high winds ripped a hole in the roof of the iconic building. But the incident has once again raised concerns over health and safety in China's infrastructure. The incident occurred at around 20:30 local time on Tuesday as winds tore a hole in the roof and sent debris over a wide area. Passengers said they saw white and yellow foam flying through the air outside Terminal 3. "Though I stood pretty far away, I could see a part of the roof was torn open," one passenger told the China Daily. "The white foam composite was everywhere, even on the runway." Designed by British architect Norman Foster and Beijing Architectural Design and Research Institute, T3 was opened in 2008. And there are concerns that design floors might exist. Foster was also behind the design of the Millennium Bridge in London which itself had to undergo modifications after it was found to oscillate wildly when opened to pedestrians. Authorities said the damage occurred during gusts of wind in excess of 85 km/h, but was repaired quickly and flights on Wednesday were not disrupted. It is the second such incident to strike the terminal. Last December gusts of around 87 km/h were responsible for tearing holes in two parts of the roof. About 200 square metres of the 320,000 square metre roof was damaged. According to reports, more than 200 delayed and 28 flights were cancelled following Tuesday's incident, though authorities said heavy snow in other parts of the country contributed to the delays. 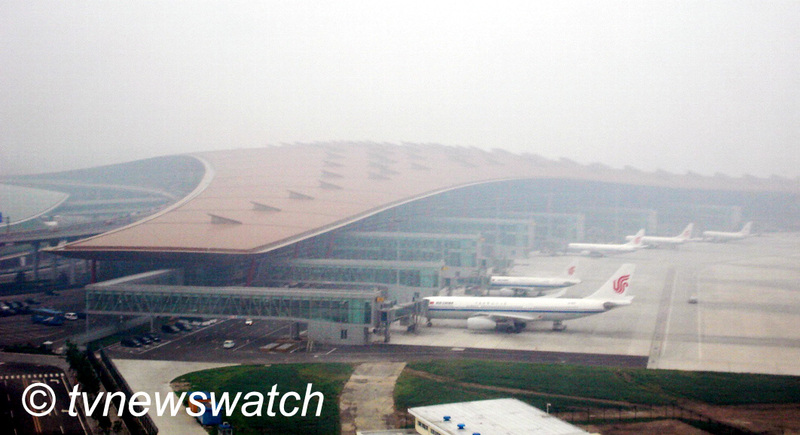 Ding Jiangang, deputy head of the capital airport's expansion project command, is on record as saying the roof at Beijing's main airport was well able to withstand wind speeds far in excess of those seen in Tuesday's or last December's incidents. And others involved in the design insist that the structural design is not flawed. Shao Weiping, executive chief architect of Beijing Architectural Design and Research Institute, said, "While architects designed the general look of T3, suppliers made special designs to make sure the metal panels used on the roof could resist strong winds." Weiping who had a role in designing T3, said, "The metal roof technology used to build T3 was a mature one that has stood tests for more than 20 years." However he raised concerns that a quality-related issue may be to blame. Some Chinese media has also suggested the rush to complete the airport for the 2008 Olympics may also have compromised safety. While the damage was relatively minor, it will once again raise some difficult questions for authorities following a spate of incidents this year blamed on poor maintenance or shoddy construction. In July this year an 11 year old boy died and several others were injured after an escalator on a Beijing subway suddenly went into reverse [tvnewswatch]. And only days later 40 people were killed in a high speed train crash [tvnewswatch / Wikipedia].